The Orange County Republican Party and Democratic Party are both heading for what may be tumultuous executive committee elections this week that have Republican Chair Charles Hart and Democratic Chair Wes Hodge each playing defense but likely heading for re-elections. Hart, who took over the party in June after the retirement of longtime Chair Lew Oliver, has had a challenging six months, responding to a handful of scandals and public faux pas, involving other party leaders and candidates, and then a pair of tough elections in August and November. But his re-election challenge is less about Hart’s management of those problems than the future direction of the party, as his challenge comes from Donald Trump activist Randy Ross, who has long contended that Hart and Oliver have done little to expand the party, particularly the executive committee. Another potential challenger with a similar beef, activist and blogger Jacob Engles, decided to support Hart after meeting with him over potential changes to attract younger Republicans. The Republican Executive Committee election is at 6:30 p.m. Thursday at the Marks Senior Center. Hart has a long list of endorsements including candidates who won, such as state Rep. Rene Plasencia, and some who lost, such as Bob Cortes. And he is touting several accomplishments, including the best fund-raising year the county party has ever had, the highest Orange County Republican voter turnout ever seen in a midterm election, and several firsts, including county-wide phone banking. “I’ve provided leadership in a very difficult time for the party,” he said. “These past five months have been about the hard work of the organization. I’ve been a chairman that has considered the membership of our organization the most important thing we have and looked for every possible way to elect representatives,” Hart said. “This was a year unfortunately that Democrats were very motivated to vote,” he added. Ross ran for the chair’s position against Oliver in 2016 and lost in a landslide, then ran in June for the vice chair’s post, and lost that by a landslide. 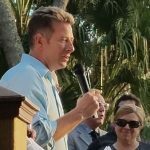 Founder and leader of the Orlando-based Trump 2020 club, Ross has been tilting at the county party’s leadership and infrastructure throughout his nearly four years on the executive committee. “I believe the current board is doing exactly what Lew did: they’re trying to keep people from being part of it, rather than encouraging and bringing people in,” Ross charged. In each case, there is little love lost between the current Orange County party chairs and their challengers. Hodge, elected two years ago, has had a cleaner year than Hart’s, with little overt controversy, and Democrats claimed victories up and down the ballot in August and November. But he’s being targeted for allegations of micromanaging, consolidating power within a small circle, and lack of transparency. He’s facing a former Florida House candidate who had to drop out of a 2017 special election, Paul Chandler, and a couple of his lieutenants also are being challenged. Chandler and Hodge feuded in 2017 when it was discovered that Chandler’s qualifications to run for the House District 44 seat were challenged, leading him to drop out shortly before the October special election. 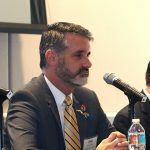 Chandler charged Hodge with offering no support and undercutting him in that HD 44 imbroglio, which Hodge disputed. Ironically, Chandler’s qualifications were challenged in a lawsuit filed by Hart, back when Hart was not yet an officer of the county Republican Party. Hodge declined to discuss Chandler’s challenge, saying he asked everybody to be nice. Chandler did not respond to an inquiry from Florida Politics. Not that his opposition agrees. Orange County’s Democrat State Committeeman Doug Head, a former longtime chair of the party who said he did not recruit Chandler or the other opponents but supports them. Head has been openly critical of Hodge, charging him with lacking transparency, setting up phantom committees that do not have membership and do not meet, doing poorly in party fundraising, and making decisions without seeking participation from the executive committee. Head also charged that the party actually did worse than expected in the elections, considering the voter registration advantage it enjoys. “I think there is a serious problem and members ought to be concerned about it,” Head offered. The Orange County Democratic Executive Committee election is Saturday at 1 p.m. at the Frontline Outreach Center in Orlando.